Icy conditions and freezing rain hit the East Coast hard overnight. 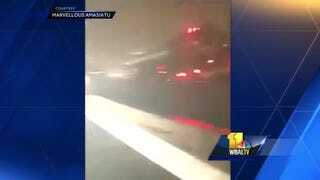 Slick roads reportedly caused over 50 traffic accidents in Virginia and the Baltimore/D.C. area was hit particularly hard. In one horrifying incident, a tanker truck overturned and exploded on I-95. A 15-car pileup occurred minutes later. As of 9:39 a.m., the D.C. bus system was suspended until further notice due to unsafe road conditions. A wintry weather advisory has been issued for the Baltimore area. And traffic, which sat in a standstill for hours, is reportedly just beginning to move again. Southbound lanes on I-95 were being diverted and northbound lanes are set to reopen soon. Reports of multiple pile-ups continue to come in. At least 12 people have been taken to the hospital and two deaths have been confirmed. Around 5 a.m., a man was filming the dangerous conditions on the side of the northbound lane of I-95 when a tanker truck tipped over and exploded. The driver reportedly died. Even rescue workers were having a difficult time. A fire engine was on its way to an accident on Interstate 66 when it lost control. Fairfax police say the engine sliped off of Route 50 but no one was injured. Reagan Airport has stayed open with delays and Dulles Airport has begun operating one runway after previously closing entirely. Motorists are encouraged to stay off the roads until at least this afternoon. The storm system is expected to drift north over the course of the day and temperatures in the mid-Atlantic will jump up to the 50s and 60s. Another round of cold weather will return on Monday.